The Hamburger Dom is a large carnival held at Heiligengeistfeld fair ground, in Hamburg. It is probably the longest fair in Germany since it consists of three parts being held in spring, summer and winter each. 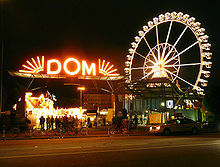 For all those adventurous people who love thrilling rides, funfair games and just the glamour and lights of a carnival, the Dom is the perfect place to be. It attracts the largest number of tourists in the whole of Germany. The winter festival is called the Winterdom or Dommarkt, the summer festival is called Sommerdom or Hummelfest and the spring festival is called the Frühlingsdom. The fireworks seen here are one of the major attractions. This fantastic display of lights in the sky is a sight to behold and will leave you speechless. It takes place every Friday evening at 11:30 P.M. If you are planning to treat your family with a visit to this funfair, the best day would be Wednesday. This is the day when the entire park is designed for families. It includes acrobats, jugglers, fire-eaters, clowns, balloon men even Easter bunnies for the entertainment of your kids. The delight of your kids upon laying eyes on these artists will be enough to make you happy. The transport to the Dom is also extremely easily available. If you do not wish to drive out this far, you can simply travel by the HVV bus or train. The Dom has its very own station for both. A few bus lines that will lead you to the Dom are bus line 9, Station Feldstraße or bus line 112, 36 and 37, Station St. Pauli. If you are visiting Germany during the time of this Dom do not make the mistake of returning home without coming here even once. It’s so extravagant that you may even compare its glory to a Disneyland! The one which inspired the Hungarian composer Oscar Fetrás to compose the popular Viennese-style waltz “Mondnacht auf der Alster”; sometimes mistranslated to English as “Moonlight on the Alster,” the river Alster actually shoots out of right side of River Elbe in Northern Germany. The river basin was also an important model for the design of the Charles River basin, constructed in the early 20th century. Having its source near Henstedt-Ulzburg, Schleswig-Holstein, it flows roughly southwards and reaches the Elbe in Hamburg forming two artificial lakes in the city of Hamburg- outer Alster and the smaller (inner Alster). The artificial lakes and the surrounding parks are an important recreational area in the heart of the city Hamburg, the second largest city of Germany. 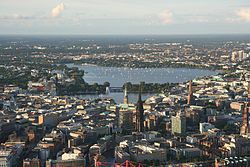 Hamburg was founded at the mouth of the Alster in the 9th century and used it as a port. The water was used to flood the moats of the fortifications. The Alster was dammed since 1190, originally to power a watermill. In 1235 a further dam was built for a second mill, which changed the shape of the river to be like a lake. In the 15th and 16th century, an Alster canal was built to connect Hamburg with Lübeck. Because of the difficulties in holding water, especially near marsh areas, the 91 km (57 mi) long waterway from Hamburg to Lübeck was navigable from 1529 to 1550 only. With the course of time, Hamburg flourished along the shores of the Alster, and several locks were constructed to make the river navigable. Until the 19th century water transport with barges were used up to the town of Kayhude. The barges—transporting building material, fuel, and foods—were staked or hauled. The Alster Touristik GmbH (ATG), a subsidiary of the Hamburger Hochbahn, provides public and touristic transport on the Alster in the city of Hamburg. The source of the Alster river is a small bog pool in the Timhagen Brook near Henstedt-Ulzburg, approximately 25 km (16 mi) north of Hamburg. It is 56 km (35 mi) long and has an incline from 31 m to 4 m above sea level. The left tributaries of this beautiful river include Rönne, Alte Alster, Sielbek, Ammersbek, Drosselbek, Bredenbek, Rodenbek, Lohbek, Saselbek, Osterbek, and Wandse (Eilbek). Its right side takes pride in holding tributaries like Mühlenau (or Mühlenbach), Diekbek, Mellingbek, Susebek, Tarpenbek, and Isebek. Hamburg is the second largest city in Germany. Its official name is Free and Hanseatic City of Hamburg and it is a beautiful place to be in. Both domestic and overseas tourists flood this city from time to time. The Hamburg City Hall is a magnificent structure and one of the major tourist destinations of the city. It is situated near the Binnenalster, the Jungfernstieg and the central station and is thus easily accessible. This hall is Hamburg’s sixth and its eclectic design appeals to all. It is huge in size with over 647 rooms and a tower that is well over a hundred meters high. A fire in the 19th century ruined the entire building and it took almost 44 years to rebuild the structure. However the long wait was worth its result for the city hall is one of the most magnificent buildings of Hamburg today. The numerous statues and ornaments adorning the building emphasize its historical significance. The façade is in Neo-Renaissance style however the interior features embellishments of different architectural periods. The City Hall is open from 8 A.M. to 6 P.M. every day and there are diverse guided tours every day. If you ever happen to be in Hamburg I would suggest that you visit this hall which represents an important part of the culture of Hamburg. Hamburg, the second largest city in Germany, is a major transport hub in Northern Germany and is one of the most affluent cities in Europe. It is also very popular with tourists who flock here at the first opportunity. St. Michaelis, or Michel as it is popularly known, is one of the major tourist attractions of this city. It is one of the five Protestant churches of Germany. Its architecture is a fresh change from that of the old churches. Its baroque style spire, the large bronze statue of Archangel Michael to whom the church is dedicated all show remarkable craftsmanship. The original building was built in 1647, but since then the church has been reconstructed twice. In 1750, it was destroyed by a lightning strike. It was refurbished at that time. Then in the 20th century it caught fire and was almost destroyed. After its reconstruction it once again suffered severe damages in the bombings of 1944 and 1945. However after its reconstruction of 1983 the church once again looked brand new. Its 132 meter tall spire, roof everything was reconstructed. Its architecture is so remarkable that around 9 replicas have been made in different parts of the world. Its size is so large that it can accommodate 2500 people and its spire is so tall that it offers breathtaking vies of the city! If you ever visit Hamburg, you must go to this church! If not for the peace you’ll get, go for the amazing views.